Before the declaration of World War II in September 1939 Queensland was not a heavy industry state. Its industries were geared to primary production and serving the needs of primary producers. The war was to change that. 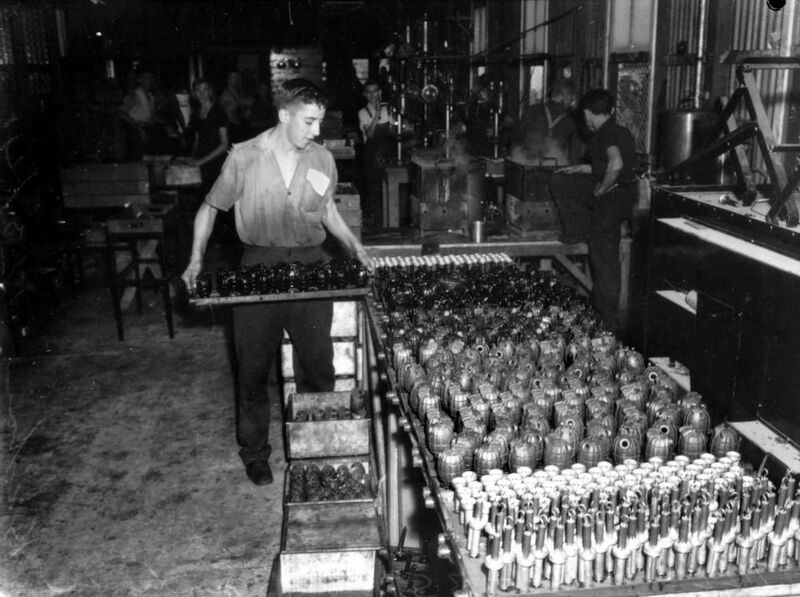 As early as September 1940 the State Munitions Board placed the first order for the manufacture of shells and grenade casings at Ipswich railway workshops. 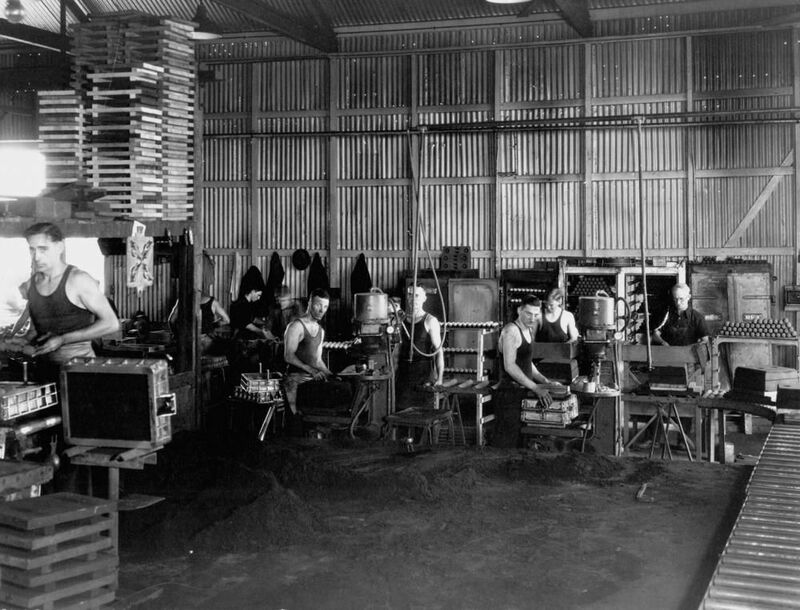 By 1941 armament industry machine tools were being manufactured at Toowoomba Foundry and Ipswich workshops were becoming a major source of munitions supply. 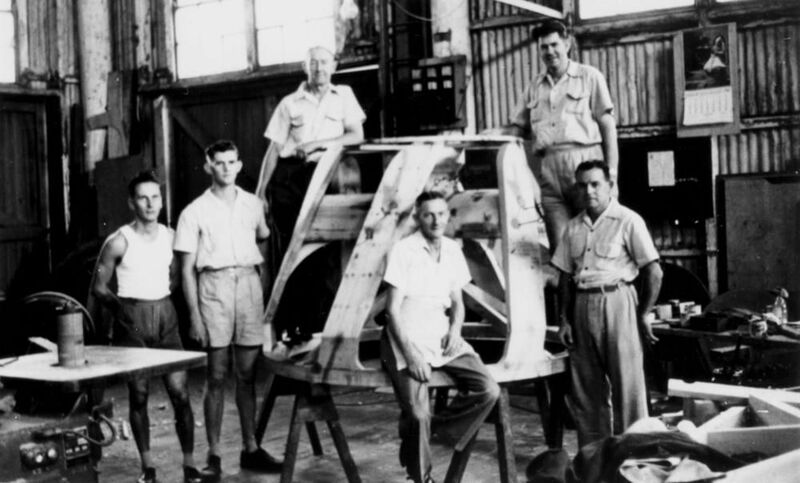 Evans Deakin and Company in Brisbane and Walkers Limited of Maryborough were gearing up for the mass production of Australian-designed naval corvettes. On 23 January 1942 the Japanese landed in New Guinea and the Solomon Islands. Rabaul was captured and Singapore fell on 15 February. The Prime Minister, John Curtin, described it as ‘Australia’s Dunkirk–the opening of the Battle of Australia’. ‘Our honeymoon is finished,’ Curtin announced to the Australian people, ‘Now we must fight or work as never before’. Rocklea, south of Brisbane, had been chosen by the Federal government as the site for a £1.5 million munitions factory in January 1941. 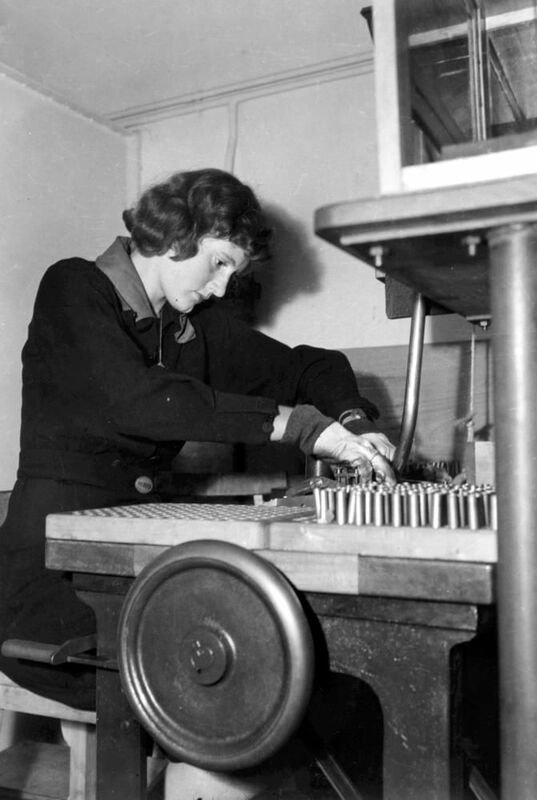 From 1941 until 1943 the Rocklea factory produced about 150 million rounds of small arms ammunition and more than one million cartridge cases for 25-pounder shells. 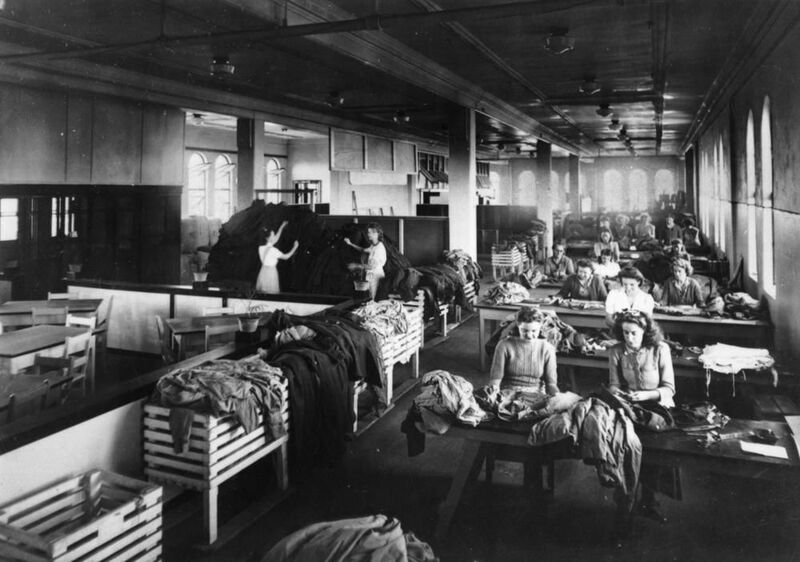 At its peak the factory employed about 3000 men and women, many of who lived nearby in government housing. Rocklea factory ceased munitions production in late 1943 when it was modified for the overhaul of US aero engines for the Department of Aircraft Production. The factory also engaged in the manufacture and repair of machinery for naval and merchant shipping at its marine engine works. 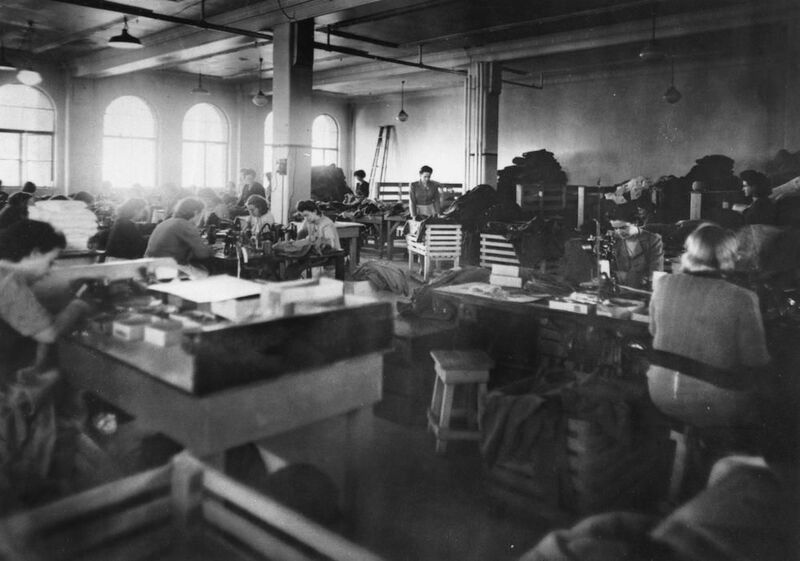 Ipswich railway workshops produced a huge quantity of war munitions. Amongst the machinery manufactured at Ipswich were a number of large lathes, aero engine crankshafts, presses for the production of shell and cartridge cases, and 25-pounder gun barrels. During the war years Walkers Limited built and engined seven corvettes and three frigates for the Australian Navy, as well as mass-producing steam and diesel marine engines. Evans Deakin, who had just completed construction of the Story Bridge, turned to ship building. Slipways and fitting out facilities were established at Kangaroo Point with four building berths constructed. The first vessel was completed and put into service in March 1941 and other ships followed rapidly. In all, over five years of war, 19 naval vessels of all classes were completed. Landing craft were made by the Ford Motor Company and other craft and engines were made by numerous small boat builders around Brisbane and at centres along the eastern coast of Queensland. Cairns became a major centre of manufacture for landing craft as US military personnel began arriving in greater numbers early in 1943. They were led by the 411th Engineer Base Shop Battalion which was responsible for major construction works around the town. The US engineers provided infrastructure for training Australian troops in amphibious landings. Cairns was chosen as the most northerly centre in Queensland for the manufacture and ferrying of boats to forward areas in New Guinea. The US Engineers erected a warehouse and boat assembly factory for the construction of plywood LCVP landing barges for infantry and light vehicle use in the planned New Guinea and island campaigns. The first boats came off the assembly line in April 1943 and soon the factory was producing six boats a day. The hulls were assembled from local plywood timber manufactured in Cairns. About 600 landing craft were produced at the Cairns plant before the production line was moved forward to New Guinea. The forestry and timber industries were among the first in Australia to be declared essential services in an attempt to exempt loggers, sawmillers and carpenters from military conscription. However the large enlistment of Queensland bush workers meant that the supply of timber from the northern rainforests fell as demand for defence purposes increased. Export of northern rainforest timbers to the southern states ceased and almost all timber produced was absorbed in regional defence works. Native pines were almost logged-out to meet the extreme demand for round timber for piles, poles and girders as well as for prefabricated buildings. The Railways Department also placed heavy demands on sleepers. Cairns had long been the centre of north Queensland’s timber milling industry. From mid-1942, the town’s sawmills and furniture factories operated full-time on defence works. A timber product in great demand was three-ply veneer, manufactured in sheets cut from large kauri pine logs from the Tableland which were delivered to Cairns by rail. The plywood was used locally in the manufacture of everything from bunk beds and prefabricated huts to barges, landing craft and aircraft propellers. Prefabrication as a solution to military building shortages in wartime was not new. In World War I the Nissen hut with its semi-circular roof was designed in Britain as a portable building for use as offices, stores and hospital wards. By the 1920s, Australian firms such as Stewart & Lloyd and Sidney Williams & Company were producing prefabricated steel frame buildings for use in northern Australia including aircraft hangars, community halls and storage sheds. 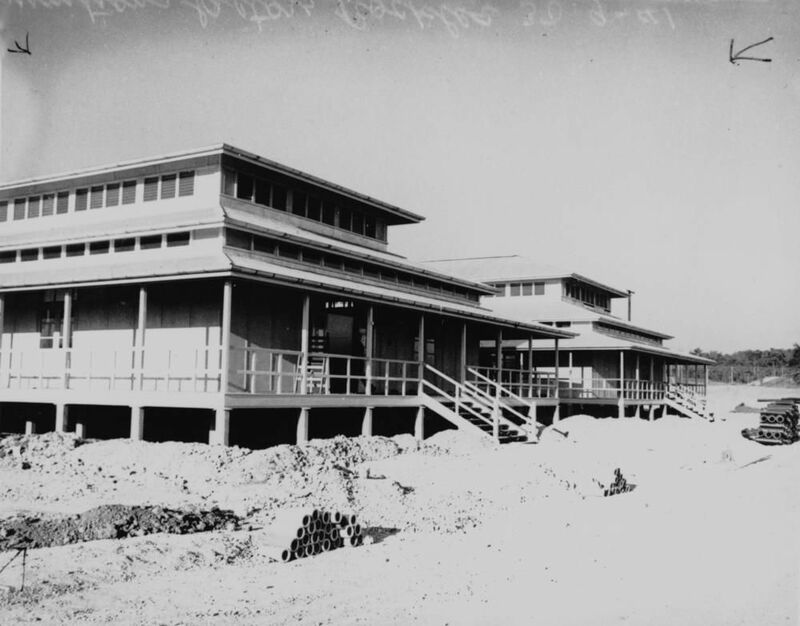 From the late 1930s the Sidney Williams–or ‘Comet’ brand–hut began to serve as prefabricated workshops, warehouses and barracks at military bases, particularly in north Queensland and the Northern Territory. The fundamental difference between these early prefabrication projects and those undertaken during World War II was mass production; a concept at the time foreign to Australian manufacturers but not to American engineers. US prefabrication was also technically innovative in terms of the size and span of the buildings constructed. The US prefabrication program introduced innovation to the Australian building industry, in particular the development of line production and the application of bundling material for dispatch. Bundling depots were established in Brisbane where the many components of prefabricated buildings–pre-cut timber, steelwork, cement, bolts, electrical and plumbing items–were bundled and packaged ready for shipment to forward operational areas for assembly. The timber would be cut at the timber mills to predetermined sizes and transported to the bundling depots. With the system in place, operational bases and field hospitals could be quickly erected in readiness for planned offensives. Prefabricated buildings became a strategic component of forward operations. Through the 1920s and 1930s Queensland developed as one of Australia’s important food producing regions, especially for sugar, bananas, fruit and vegetables, meat and dairying. 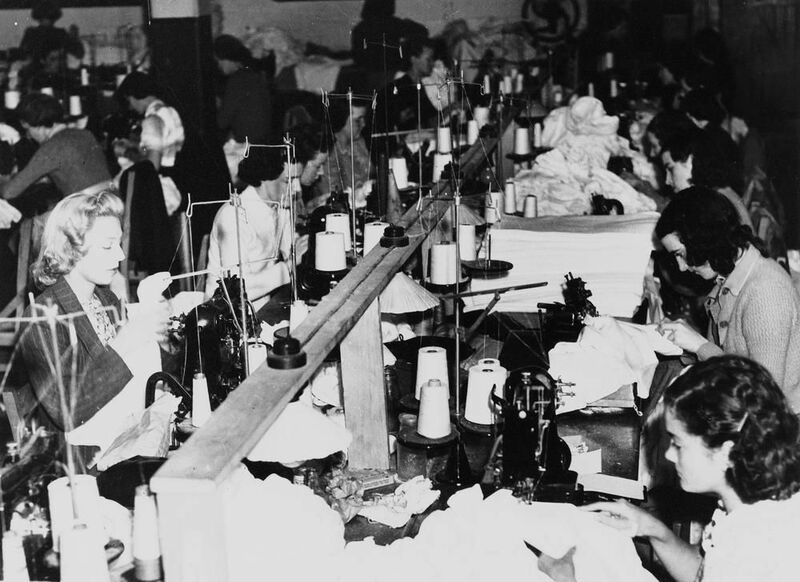 The outbreak of war saw many rural workers enlist in the services, causing shortages in production. During 1943 heavy demand for beef from the growing number of Allied service personnel stationed in north Queensland outstripped supply from the region’s meatworks. Transport for cattle from western Queensland to coastal meatworks had become harder and more difficult to organise because of wartime demands on the rail network. A heavy demand for canned meat for combat troops accentuated the critical supply situation. The Queensland Meat Industry Board (QIMB), which had regulated the state’s meat industry since the early 1930s, became responsible for the coordination of wartime meat production. It established army-operated meatworks and cold storage facilities at Mount Isa and Cape River. Construction of army slaughter yards and cold rooms at Mount Isa was an early priority and this work was completed in late 1942. During the same period, the Board ordered the construction of a large meatworks on the Cape River near Pentland, west of Charters Towers. Construction of the Cape River meatworks started early in 1943. The works were operated by the 2/1 Australian Butchering Company. Large mobs of cattle were railed from western Queensland for slaughter at Cape River and the frozen beef was then distributed through Townsville to Australian and US forces. 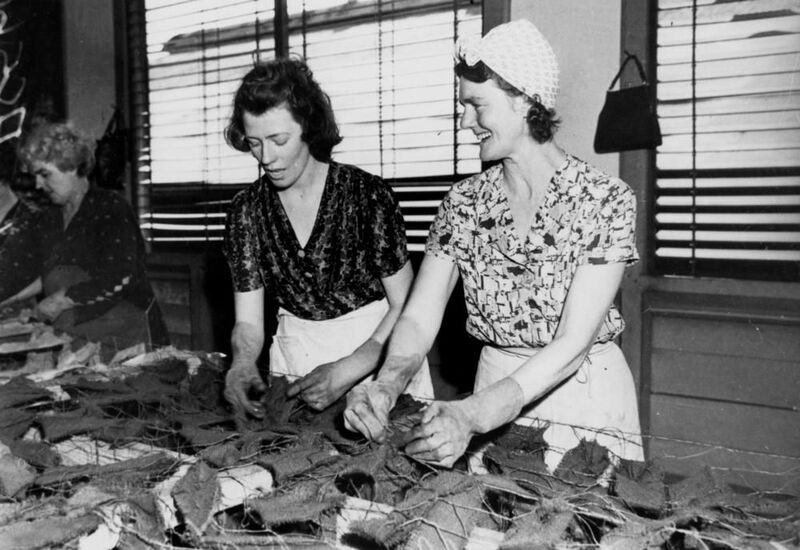 Meat supplies for Queensland civilians were severely rationed and did not return to normal until 1949. Supply of fresh fruit and vegetables to Australian and US service personnel was co-ordinated by the Committee of Direction of Fruit Marketing (COD). 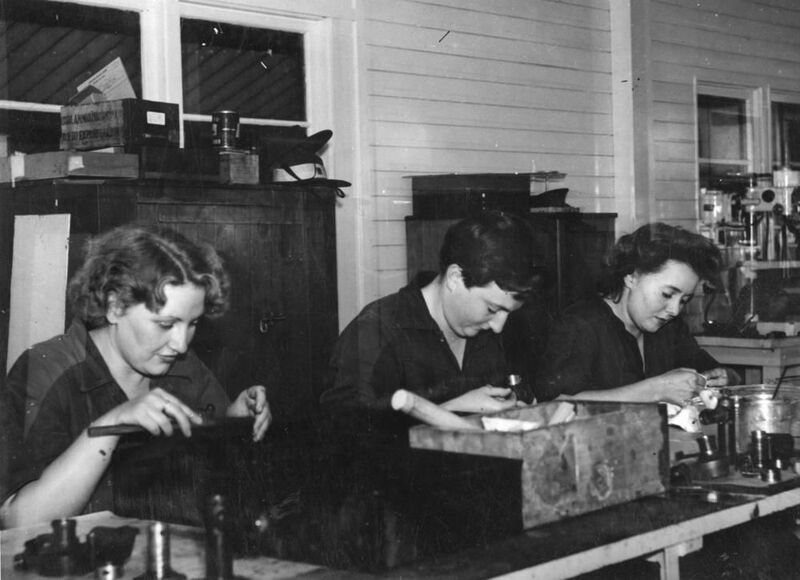 With large concentrations of troops at military camps throughout north Queensland, COD depots were established at Rockhampton, Townsville, Cairns and Atherton by mid-1943. Although food production was increased on army farms in the central and northern regions, supplementary supplies had to be obtained from Brisbane and the southern states. South-east Australia’s rail system was overstretched, hauling heavy consignments of troops and munitions, as well as foodstuffs to Queensland and the Northern Territory. As rail transit time from Melbourne to north Queensland was seven to eight days, careful co-ordination was required between the COD, the Department of Commerce and Agriculture and the railways to ensure that fruit and vegetables arrived in edible condition. Sugar production fell dramatically in 1942 and 1943 as the overzealous internment of Italian farmers and cane cutters in 1940 followed by the enthusiastic enlistment of local farm workers into the military created shortages in the cutting gangs and crushing mills. Japanese occupation of Nauru and Ocean Island meant that, by 1943, phosphate for fertilizer was also in short supply. Delays in rail transport held up cane supplies to the mills and the refining of raw sugar. The release of interned Italian farm workers following Italy’s surrender in mid-1943 brought some improvement in the north Queensland sugar industry. The discharge of experienced sugar workers from the armed services, improvements in fertilizer supply and the return of seized tractors by the Allied Works Council all contributed to an improvement in food production during 1944. Dairy production on the Atherton Tableland also suffered with the enlistment of many farmers and farm workers. 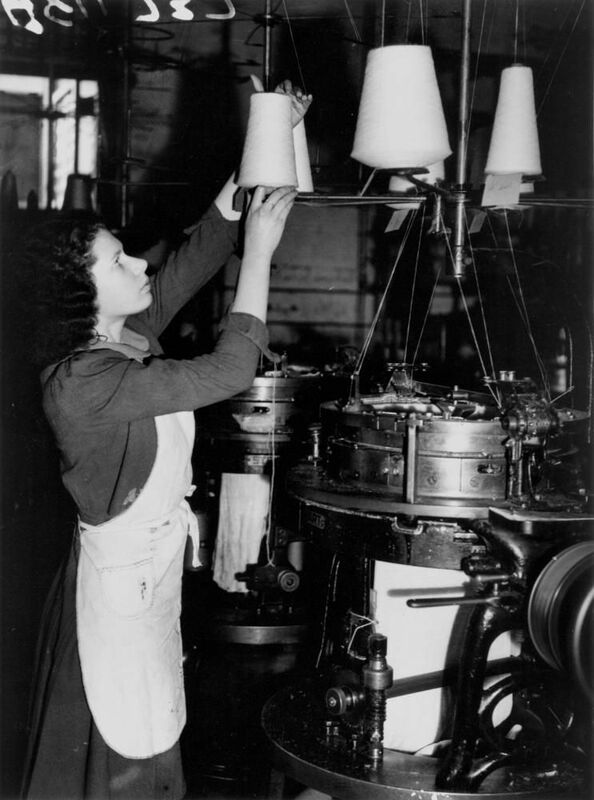 Increased government subsidies on milk and cream in 1943, together with the release of enlisted farm workers, resulted in a rise in milk production from 1944. Fresh milk from the Atherton Tableland was distributed by air to points across north Queensland, the Torres Strait, New Guinea and other centres throughout the south-west Pacific war zone. World War II saw a surge in demand for copper. 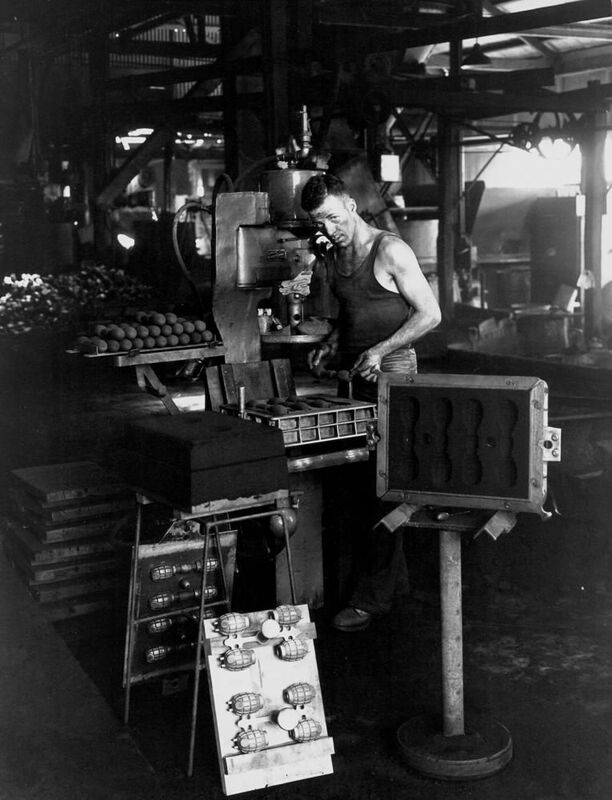 A national review of base metal production in 1942 led to the closure of the rundown 40-year-old Chillagoe smelters in north Queensland, in favour of concentrated mining efforts at Mount Isa in the state’s far west. Large reserves of copper had been discovered in the Mount Isa Mines Black Star leases in 1941. By the end of 1942 the company was in the process of switching production from lead to copper in response to federal government demands. Disused smelting plant on the abandoned Cloncurry copper field was dismantled and railed to ‘The Isa’. Copper smelting commenced there in April 1943 using antiquated blast furnaces from the World War I copper boom to boost wartime production. Nearer the coast, the West Moreton coalfield near Ipswich and the large Bowen Basin field inland from Mackay were working at full capacity throughout World War II in the production of coal for power generation, metal smelting and railway locomotive use.